As Kureon leers over Ui on the rooftop, Tyramigo leads Koh, Melt and Asuna to a cave where the other two Kishiryu went to hide. Koh shrinks Tyramigo and they head inside. Asuna excitedly decides to name her Kishiryu Ankyrose. Melt, however, is a little colder with his Kishiryu. Koh and Tyramigo tell him to warm up a little bit and not be so condescending. Back home, Papa Tatsui notices Ui is kind of pale and weak-looking. She says she’s just tired from editing all night. He leaves for the day. Ui wonders if she’s catching a cold. Just then, she gets a video alert of a Minusaur rampaging downtown. She hurries over as the Ryusoulgers appear and morph. She records the whole scene. But the Minusaur wants everyone to look at her. And when Koh does look at her, he turns to stone. Melt and Asuna try to cover their eyes and fight the Minusaur at the same time, but it’s impossible. Suddenly, a bright light shines at the Minusaur. It comes from Rysuoul Black! And he is accompanied by Ryusoul Green. 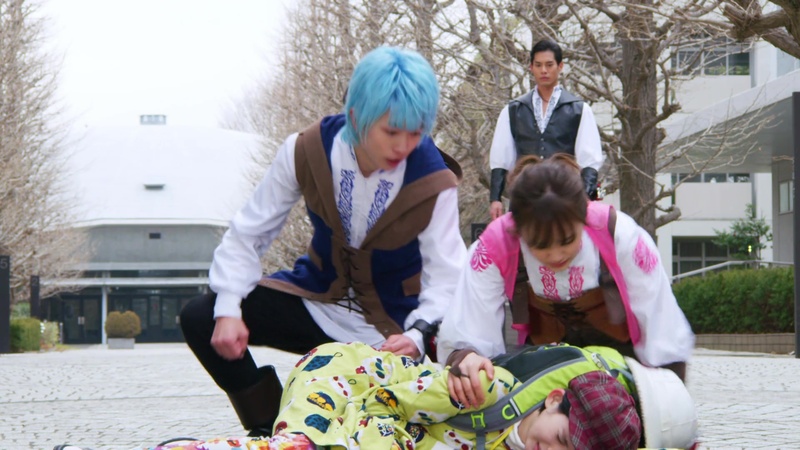 Before the new Ryusoulgers can finish off the Minusaur, Kureon appears with some Drunns to protect it. Black and Green use some Souls to easily take care of the Drunns. Kureon and the Minusaur walk away and Tankjo arrives to stop Melt and Asuna from following them. Tankjo slams the ground and forces them to demorph. Black and Green demorph and Green mocks Melt and Asuna for being so weak. Ui suddenly collapses nearby. Melt and Asuna hurry over to her and sees her life energy is being sucked up as the source of the Minusaur! They take her and Koh home. 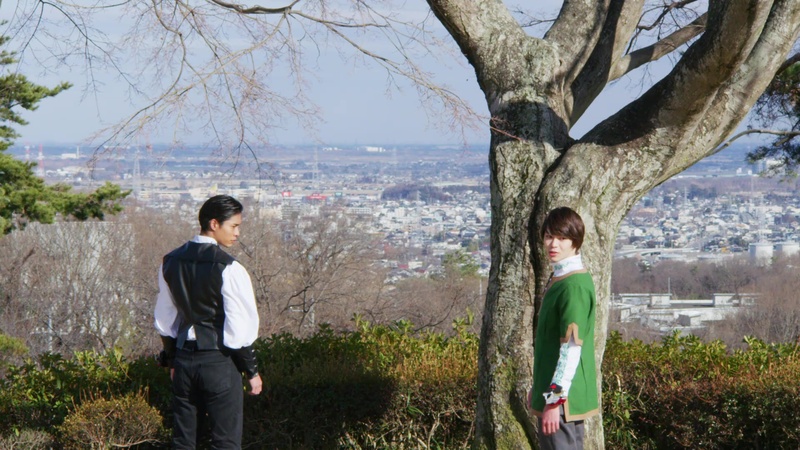 Ryusoul Black uses a Soul to break Koh out of stone and he introduces himself as Bamba and his brother, Towa. Koh immediately considers them their comrades, but Towa says they are not. Melt says they must find the Minusaur’s weak point. But Towa and Bamba have an easy solution. Bamba walks over to Ui and is about to slice her head off. Koh stops him. Bamba and Towa say the Minusaur dies if Ui dies and explain that a Minusaur is complete when it embiggens, thus resulting in thousands of deaths. So they must kill the Minusaur before that happens. And the easiest way is to kill the human it was born out of. Koh says they can’t do that. But Bamba and Towa say it’s either one person or the greater good. Melt says that makes sense. Asuna scolds him for even thinking that. Koh proclaims they will save both Ui and the lives of many. Towa laughs at him. Bamba says they will kill Ui if they believe Koh, Melt and Asuna can’t defeat the Minusaur. Koh is sure they can defeat it. Melt gives him a sideeye. But they don’t see Ui has been awake and listening to them the entire time. Later that night, Ui approaches her father as he is working. She tells him how awesome he is. She remembers how he was laughed at when he was searching for undiscovered dinosaurs. But he believed they existed and now everyone in academia calls him crazy. Next morning, Asuna looks for Ui. But Papa Tatsui tells her Ui had something to do so she left. Asuna is worried and hurries out. Koh and Melt are downtown and they morph when the Minusaur has embiggend. Asuna finds Ui by the ravine where there are Danger signs posted all over. Ui asks how Asuna found her here. Asuna says Papa Tatsui told her he and Ui used to search for fossils around here. Ui says it was fun when her father would take her along for excavations. Ui says her father, Koh, Melt and Asuna are all amazing, hardworking, shining bright. But she’s always just fallen short. That’s why she feels she can at least do this for her part. That is, kill herself by jumping in the ravine so the Minusaur can be defeated. Ui prepares to jump, but Asuna holds her and pulls her back. Ui tries to fight her off, but Asuna pulls her in for a hug. Asuna says she will not lose Ui like this because they are all friends. Asuna assures Ui that they will defeat the Minusaur another way. But suddenly, more life energy flies out Ui and she loses consciousness again. Asuna lays her down and tells her to believe in them. Asuna leaves Ui by the ravine and hurries off, not knowing the Bros are nearby watching and ready to murder. The embiggened Minusaur stones everyone watching her and the live coverage of her. Koh calls Tyramigo and hops in to activate KishiryuOh. They try fighting by blocking their eyes, but it is still too difficult. Asuna arrives and tells Melt not to feel so defeated. She calls Ankyrose and urges Melt to call his Kishiryu. Melt doesn’t think his Kishiryu will come. But Asuna takes the initiative to call his Kishiryu for him. Just as Towa is about to murder Ui by slicing her open, the two Kishiryu burst out of the mountain. The Bros are shocked. The Minusaur slices a building in half, killing everyone inside, as the two Kishiryu try to hide her stone gaze. Melt has an idea. He calls to his Kishiryu and asks it to lend him his power. He now believes he should save everyone, both the one and the many. The Kishiryu responds and they all work together to find a way to block the Minusaur’s stoning power. 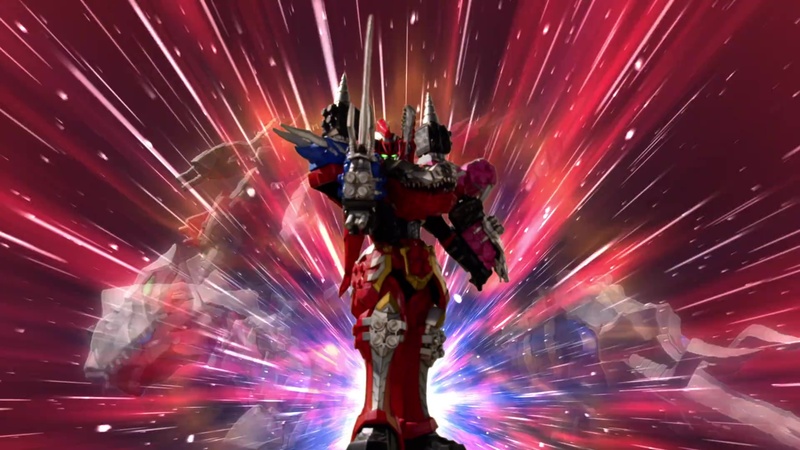 Koh initiates a Ryusoul Gattai and the three Kishiryu combine into KishiryuOh Three Knights. With a Final Blade, the Ryusoulgers are able to defeat the Minusaur. Back home, Ui wakes up and is good as new. Her father offers her some milk as Koh, Melt and Asuna are happy to see she is fine. Ui quickly hugs her father and says she is home. He welcomes her home. Asuna points out that Ui was lonely and wanted people to notice her. That is the emotion the Minusaur was born out of. Koh wonders why people looking at the Minusaur caused them to turn into stone. Melt shows him Ui’s YouTube videos and he freezes up because they are horrible. 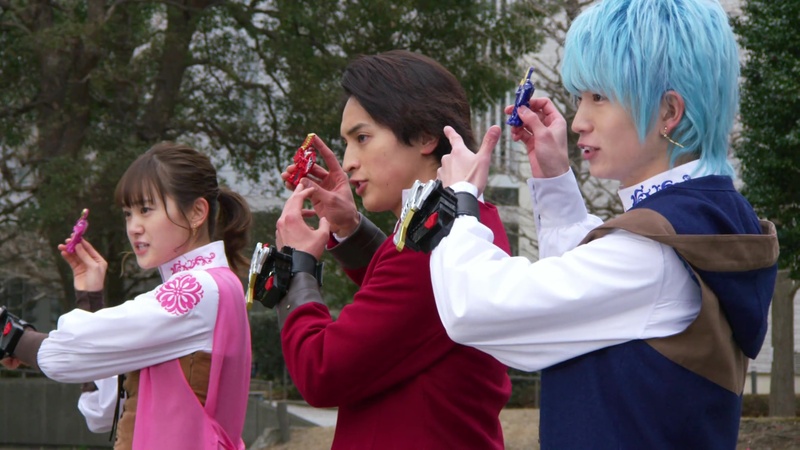 Meanwhile, Towa acknowledges the Ryusoul3 did pretty well for themselves. But Bamba thinks they need to quickly search for their Kishiryu as well. Well that definitely escalated quickly didn’t it? Ui almost committed suicide while the brothers have no qualms about murdering her. WTF?! This is the same show as the one with the dancing dinosaurs, right?! Now, I don’t even know where to start here. I think this episode was definitely a couple of episodes too early. This is only episode 3 after all. Let’s keep that in mind. So I definitely like that we can see a more serious side of Ui. But this would’ve been a better episode later on after we’ve actually learned more about her. We’ve only seen her being this goofy YouTuber. But we really didn’t see that she might have had insecurities. 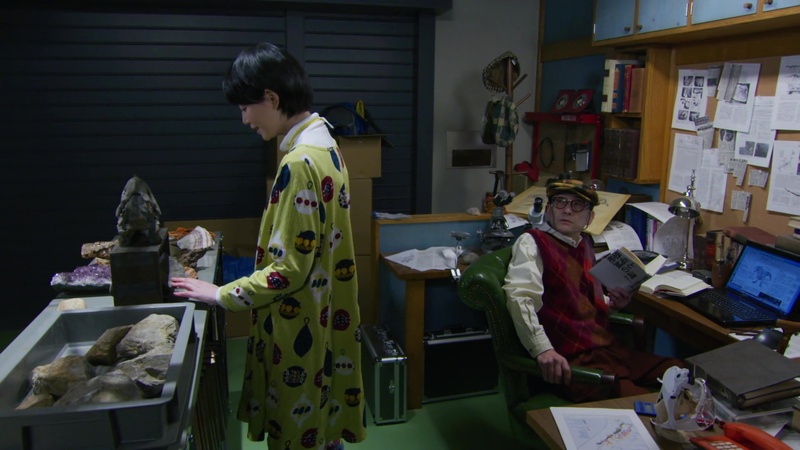 Her maybe feeling inadequate compared to her father and the Ryusoulgers is certainly a legitimate possible story for her character. But while we saw she made corny jokes on her videos, we also didn’t see that she is apparently so horrible that she can stupefy her audience. All that aside though, things got very dark, very quick. Ui was going to kill herself. Now, sacrificing oneself has been a noble plot device in many a toku show in the past. But Ui’s moment here carried much more weight as presented. There was obviously a deeper mental health angle to the whole situation that pretty much got glossed over in almost a throwaway kind of way. They even threw in another gag at the end with Koh freezing up at her horrible videos. Ui was willing to kill herself than to be a burden on her father or new friends. And let’s remember that Ui grew up without many friends, if any at all, according to her father in the last episode. So we can gather that she may have had a lonely childhood. That certainly could be one reason for her to become interested in expressing herself on YouTube. But the way this story was so haphazardly thrown together, in EPISODE THREE! It really is a questionable decision. I think this could’ve been an amazing storyline for her. I feel like they wasted this opportunity to tell a really serious and emotional story in a way that is respectful and also a learning experience for obviously the kids watching. At the same time, this is the same franchise that made a joke about mental health via Misao in Zyuohger. So I shouldn’t be expecting much I guess. Anyway, I really think a couple of extra episodes getting to know Ui and getting to experience the dynamic between her and her father as well as her and the Ryusoulgers would have really helped make this an incredible, powerful story. Asuna caring about her so much feels forced here when it would’ve felt more natural later on once they’ve gone through more struggles together. Instead, it seems like they just used her to help introduce the brothers. So Towa (and maybe Bamba I assume) have no qualms about killing someone if it’s for the greater good. But I also think their introduction was so haphazardly done as well. I actually don’t object to them being that cold and heartless initially. Again, the “greater good” argument is also nothing new to toku. Seeing them this way can be a good starting point to hopefully seeing them growing and caring more about their comrades and the people around them. It would also be interesting to learn if maybe they are this way because of some experience they’ve had in the past. And then there’s the strange plot point of Melt not vibing with his Kishiryu initially, but then magically being able to later on. Like you expect this to be that typical story of him learning to communicate with his partner mecha. But we didn’t get any of that as a resolution. Not to mention his “understanding” of the Bros’ idea of killing Ui and others like her for the greater good. He even sideeyes Koh wanting to save everyone. Like, what was that?! So again I have to remind myself, this is the show with the dancing dinosaurs at the end of every episode right? Lol My goodness. This was kinda insane. Problems aside, this was an episode that really was a few months too early. But it certainly shows that there is a lot of potential with this season and it is definitely not like any season that I’ve watched so far. It’s still very early, but I do have some high expectations moving forward. I don’t want to set myself up for disappointment. But there’s definitely a lot of promise here and I hope this Episode 3 was not indicative of how things will be moving forward. The first two episodes were a strong start, but this episode really came out of left field. 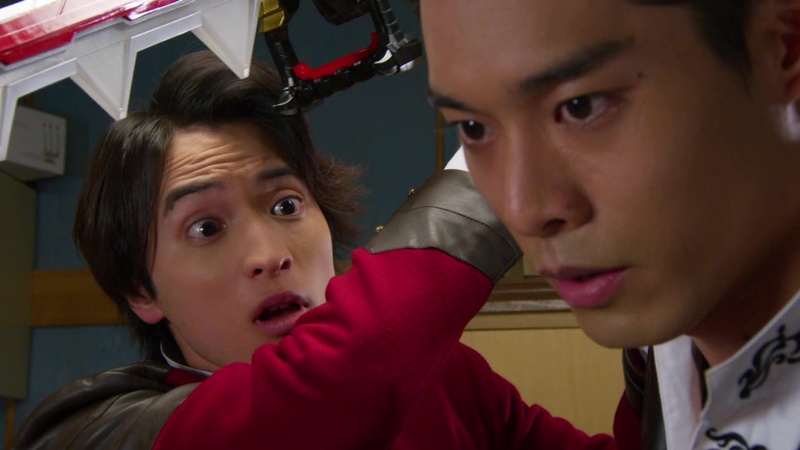 This episode had the “You got my Kamen Rider into my Super Sentai” in regards to tone as, like you said, events and introductions happened too soon before we got a good idea of certain characters, like Ui and Melto. Ui’s loneliness is a potential long-term plot that could be explored and make her a target for the Druidons in creating Minusaurs; as depression is not something that can be solved in one episode and they never said the Minusaurs couldn’t re-target someone to create more Minusaurs, as negative emotions manifest daily. Towa and Bamba’s “Greater Good” idealogy most likely stems from their experiences during their wandering and the mysterious cowled figure that appeared to them in the previous episode; which is something that could be introduced in a later episode. Melto not being in sync with his Kishiryu is probably the one that could be resolved the quickest; but wasn’t the best time to address in a plot-packed episode that all those threads could’ve been stretched out to become more satisfying arcs, not more or less resolved in one episode. Overall, this was an okay episode that suffered more from the dark escalation without proper resolution of it; while trying to keep the Sentai entertainment going. But, I hope it doesn’t fall under the Ghost problem; where they explore a dark tone, but then realize they also market to kids, and lighten up too much. I definitely agree on all your points. With Ui, I think she could’ve even been a final arc or at least midseason climax kind of Minusaur target too. Where they have to rush to save her as well in addition to her dealing with her own mental health too.